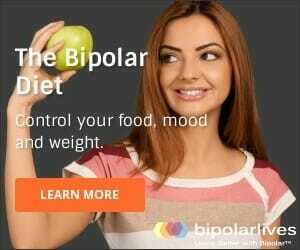 Why would you need a Bipolar 2 Test? Because both the treatments and symptoms for the different types of bipolar disorder are different. Bipolar Type I is often best treated with different medications than those for Bipolar Type II, so testing to pinpoint your precise condition is very important. hypomania rather than full blown bipolar mania. If you want a basic self-screening test, see our free online bipolar test. and scored by patients independently. tests provided here are BIPOLAR SCREENING TESTS – NOT DIAGNOSTIC TESTS! for a follow-up in order to get a clearer, more definitive picture. face-to-face consultation with an expert in order to be diagnosed. The tests provided here are for screening only. A positive screen does not mean you have bipolar disorder – just that you should follow-up with an expert! As long as you understand that limitation, a widely used Bipolar 2 Test is the The Mood Disorder Questionnaire (MDQ) from the Depression and Bipolar Support Association (DBSA). only takes about five minutes and can be scored immediately as well. screening for a range of different types of bipolar disorder. This means it is useful as a specific Bipolar II Test. However, lately there has been some criticism that the MDQ may not be sensitive enough or accurate enough for widespread use. Researchers in Rhode Island in 2013 found that the MDQ test often misdiagnosed patients as bipolar when their real diagnosis should have been Borderline Personality Disorder. This is quite a problem as the treatments fro bipolar disorder and borderline personality disorder are quite different. Another popular bipolar test when screening for Bipolar Type 2 is the Bipolar Spectrum Diagnostic Scale, also known as the BSDS. developed by Boston psychiatrist Dr Ron Pies and has been evaluated by Dr S.
misdiagnosed – often for many years. This is extremely sad and dangerous. Failure to diagnose correctly does not just mean the tragic consequences of missing out on treatment – frequently it leads to people receiving drugs that actually trigger mania and makes their disorder worse. University Press, 2007), the BSDS is discussed and described as “promising”. The BSDS is preferred as a specific Bipolar 2 Test as it is thought to be more effective for detecting the more subtle forms of the disorder. This test is not as good as the MDQ for a clear YES/NO answer, but again is intended to pick up milder forms across the full bipolar spectrum. 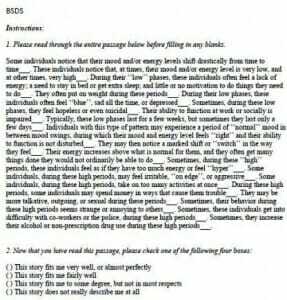 As you can see, a bipolar self-test can be done online, based on traditional paper and pencil questionnaires. 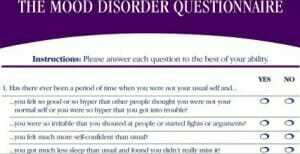 This type of bipolar disorder test can tell you everything or nothing! and behaviors and are able to be honest and accurate in your answers. ANY OTHER BIPOLAR 2 TEST ALONE IS NOT ENOUGH!